Guaranteed laughter...you can bet on it! 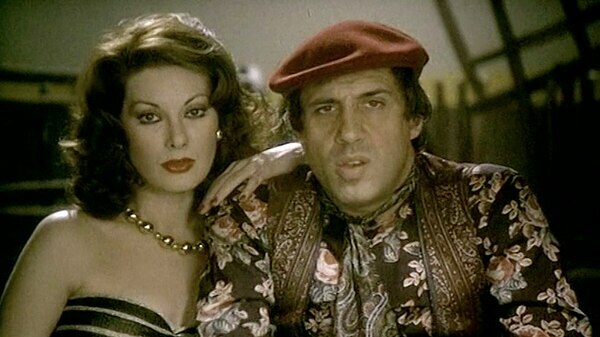 In this sparkling 1981 Italian comedy, expert poker player Ace (played by Italian pop singer and comic actor Adriano Celentano) gambles away his wedding night at a local bar, and wins a tidy sum of money against a sore loser. As he heads home to his waiting bride Silvia (Edwige Fenech, Hostel: Part II), he is killed by a hired gun. When he reappears to his wife, Ace has a hard time convincing her that only she can see him—he is definitely invisible to everyone else, and definitely quite dead. Aghast at her determination to work as a dancer, Ace undermines her rehearsal and then schemes to get her married off to an "appropriately aged" and wealthy banker. But the bigger question remains: Is there divorce after death?